Calixto Corrium was an Imperial who lived a life of leisure in Windhelm during the Fourth Era. He used to go adventuring with his sister Lucilla until she passed away. After that, he settled down and opened Calixto's House of Curiosities to put on display the assortment of curiosities he had collected, such as The Book of Fate and Ysgramor's Soup Spoon. At one point, he was a member of the College of Winterhold. 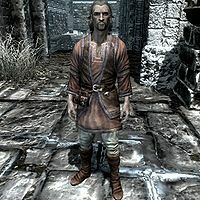 In 4E 201, a killer stalked the streets of Windhelm known as the Butcher. It was eventually revealed to be Calixto, whose grief over his dead sister had driven him to murder and necromancy as he attempted to bring back her spirit. He murdered several young women in the city before he was discovered and dispatched.